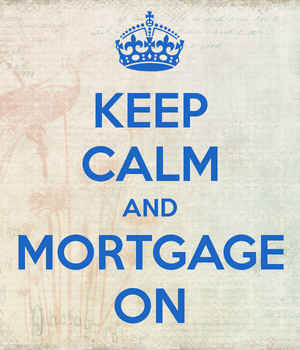 How Long Do You Plan to Keep Your Mortgage? The mortgage landscape has changed a ton over the past several years. Mortgage lending guidelines have firmed tremendously since the housing crisis took hold, and mortgage rates have fallen to new all-time lows. Meanwhile, home prices seem to have bottomed, and decent home price appreciation is in the forecast. This has created an interesting environment for both prospective and existing homeowners. Perhaps one of the biggest changes in thought is that those who take out a mortgage today will keep it for as long as they own their home. In the past, this wasn’t the case, with mortgage rates very high, and then in a downward trend for many years since. That allowed existing homeowners to refinance and tap home equity via cash out refinances and HELOCs, while also reducing monthly mortgage payments. Even recent homeowners were able to refinance just six months or a year after purchasing their homes, thanks to the precipitous drop in interest rates. But that march downward seems to have come to an end, and could in fact reverse course, which will equate to slower prepayment speeds and far fewer refinances. After all, no one will be keen to lose your super low mortgage rate, even if they do need cash. It also makes the question of which mortgage to get more difficult. Additionally, one really has to question whether they should buy down their mortgage rate. People sell their homes for all types of reasons, and many do so well before their mortgages ever reach maturity. The most common reason all homeowners move is to obtain a better home, this according to data from the 2017 American Housing Survey (AHS). It’s also pretty normal to sell a home in order to buy in a better neighborhood, or for a first-time buyer to sell in order to form a household (think more space). Other reasons include being closer to family, shortening a commute, relocating for a job, reducing housing costs, being forced to move, or simply because of a change in household. You should consider all these reasons before you decide on a particular type of home loan. It might sway your decision. 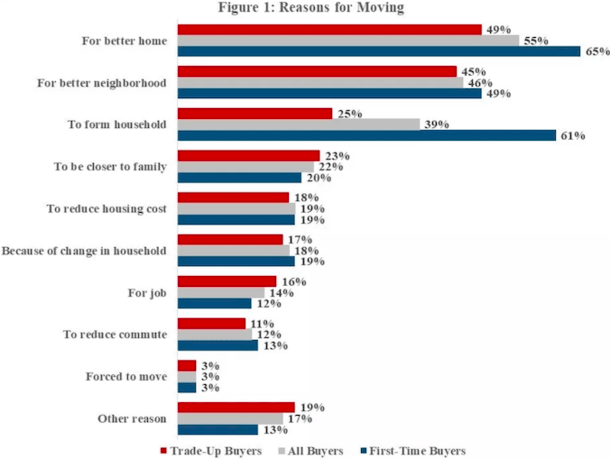 Take a look at this chart from the National Association of Realtors Profile of Home Buyers and Sellers. 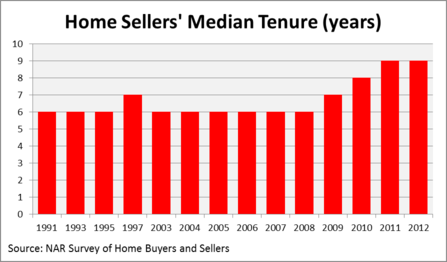 The median tenure for a home seller over the past two decades has been just six years. I guess forever homes are a thing of the past. As you can see, tenure increased after the mortgage crisis, mainly because underwater mortgagors had no choice but to wait it out. But many of those who persevered have now listed their homes, just as they are getting their heads above water. The point I’m trying to make is that very few mortgages are actually held to term, or anywhere close to it. For one reason or another, mortgages just don’t last that long, despite many being 30-year fixed mortgages. When looking at this chart, one could reasonably wonder why more homeowners don’t take out short-term adjustable-rate mortgages, such as 5/1 or 7/1 ARMs. The savings would massive. Both offer lower mortgage rates than their fixed-rate cousins, which would result in a lower monthly payment, less interest paid, and more principal accrued. Yet most homeowners seem reluctant to go with an ARM, perhaps because it’s difficult to predict the future. Still, the numbers don’t lie – scores of homeowners are on the move in just six short years, whether they hold 30-year fixed mortgages or whatever else. Will You Keep Your House Longer Now? As I noted, the landscape has changed quite a bit. So will the same trend hold true going forward, or will more homeowners choose to stay put for longer? I’m sure the average homeowner tenure will increase somewhat, but probably not by that many years. There will still be tons of homeowners that sell in a short period of time for a bevy of reasons. And so homeowners will continue to take out long-term fixed mortgages that don’t do them much good, aside from the peace of mind of knowing their rate won’t change. More recent data suggests an average holding period of about a decade. Sure, it’s slightly longer, but since most mortgages come with terms of 30 years, it should still make you question why you’d pay to lock in a rate for triple the time necessary. Of course, rates on fixed mortgages and ARMs aren’t all that different at the moment, so it’s not a terrible mistake to make, if you can even refer to it a mistake. Still, you might be able to save some big bucks if you go with a 10/1 ARM as opposed to a 30-year fixed over the course of 120 months, not to mention build equity a bit faster. In the cities listed above, tenure is the longest, per updated data from NAR for 2018. In El Paso, Texas, a full 99 months go by between sales on the average home there. While it sounds like a long time, it’s still just over eight years. A 7/1 ARM would cover most folks there, and even if the rate adjusted higher for one year once it became adjustable, the savings realized during the first seven years would likely eclipse any payment increase. As you can see, lots of homeowners in the cities above could benefit from the short-term financing afforded with an ARM. In most cases, a 5/1 ARM would mean a fixed rate during their entire stay. What’s even more worrisome is that some homeowners are paying to refinance, or paying mortgage points at closing to obtain a lower rate. Unfortunately, many of these homeowners won’t hold their mortgages long enough to benefit from the future savings. So use a refinance calculator if you’re thinking about doing this. After all, the trend to sell in 10 years or less is one that will be hard to shake, even in light of the unprecedented situation we find ourselves in today. Still, you should definitely ponder the fact that the mortgage rate you receive today will likely be the lowest you’ll ever have – that may sway your decision to part with it so soon. Read more: Are mortgage points worth it? This is exactly why I’m happy to take out an ARM. I don’t plan to stay in my home more than 5-7 years, so why pay the premium for a 30-year fixed? ARMs are cheaper and I save hundreds each month. For some reason people think they’ll never move, but they always do for some unseen reason.